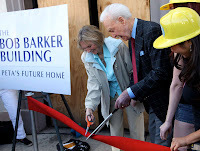 As we reported yesterday, animal welfare advocate Bob Barker contributed $2.5 million to PETA for the opening of a new office in downtown Los Angeles. The office will house PETA’s media, marketing, youth outreach, and campaign departments and will bring more than 100 jobs to The City of Angels. An angel in his own right, Barker is a longtime supporter of animal rights. Our friends at PETA gave us permission to post the fantastic photos that were taken at yesterday’s ribbon cutting ceremony hosted by Bob Barker and PETA President Ingrid E. Newkirk. Photo Credit: Thank you to PETA.